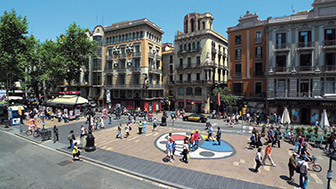 One of the most famous avenues, El Paral·lel, was, at the beginning of the 20th century, considered to be the Broadway of Barcelona and the Catalan Montmartre. These days El Paral·lel is still an avenue full of lights, theatres, music halls and cafes. It is undoubtedly the boulevard with the greatest variety of musicals, comedies, vaudeville and cabaret, a place where you can have a great time! 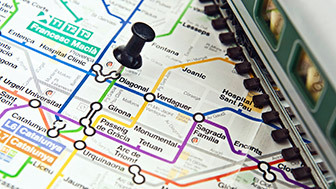 Open from Sants to the sea, El Paral·lel crosses three of the city's districts (Sants-Montjuïc, Eixample and Ciutat Vella) with its own identity linked to its origins. The avenue was designed by architect and urban planner Ildefons Cerdà, who also created the famous Eixample layout, and opened in 1894 in an area of vegetable plots and factories that seemed a no man's land. There are various theories on why it is called Paral·lel, but the most surprising suggests that it is due to the fact that it coincides exactly with the 41st parallel. This so-called no man's land very soon forgot its factory beginnings and today only the three chimneys of the old La Canadiense electric plant remain. Immediately it opened up to the world as one of Europe's most important roads in terms of leisure activities, parties and scoundrels. El Paral·lel filled with cafes, theatres, music halls, circuses and cabarets, and vaudeville and cuplé held their own against the performances at the Liceu. There was fun to be had for all the working classes, who flocked here from the crowded neighbourhoods of Ciutat Vella. But El Paral·lel also attracted the rich and upper classes from the higher areas of the city, looking for an environment far from their stiff morals, as well as political radicals and anarchists, like Lerroux and El Noi del Sucre (the Sugar Boy), who wanted anonymity for their meetings among the masses who invaded this wide avenue. El Paral·lel had everything for everyone, and there were revues like those of the famous Bella Dorita, and works of playwrights such as Santiago Rusiñol, author of the famous play L'auca del senyor Esteve (Mr. Stephen's Storybook). El Molino, one of the best-known burlesque cafes in Europe and a tribute to the Moulin Rouge in Paris, has been preserved from that time. But other playhouses, like the Apolo, Teatre Victòria, Condal and BARTS mean that the curtain is always about to go up. 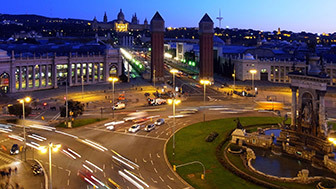 Plaça d’Espanya is a nexus of large roads and is one of the city's nerve centres.